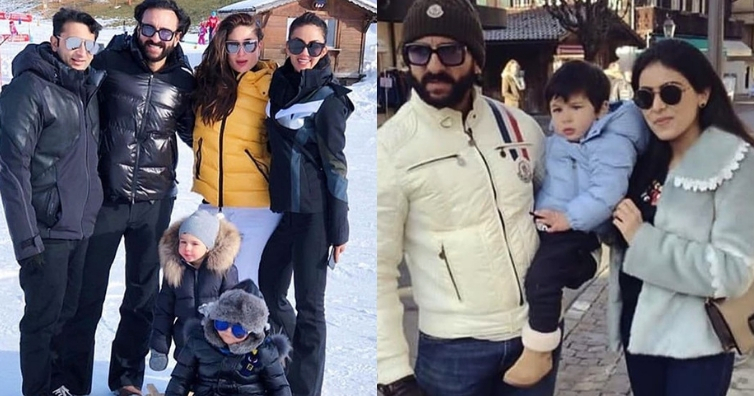 Bollywood actors Kareena Kapoor and Saif Ali Khan are currently enjoying their New Year vacation in Switzerland with their toddler Taimur Ali Khan. Recently, some of the pictures from their vacation is doing the rounds on social media. Just two days to go before the new year, Kareena, Saif and Taimur were joined by their friends Adar and Natasha Poonawalla in Switzerland. The two families went for skiing along with their boys and the picture of them enjoying the Swiss winter is just too cute for words. #taimuralikhan snapped with dad #saifalikhan and big fan of prince @sahibajaura is from delhi and is vacationing in #gstaad , switzerland. In the pictures, Saif twinned with Taimur in a black bomber jacket while Bebo looked ultra-glamorous in a mustard jacket. From the pictures, it is clearly seen that they all are having time of their lives.